① On stovetop, combine water, French Onion soup and sherry (optional) in saucepan over medium heat until it gently bubbles. ② Add Chutter® and Swiss cheese and stir until smooth. Remove from heat. ③ Top with caramelized onions and garnish with parsley if desired. Serve immediately in fondue pot, chafing dish, or warm cast iron skillet. 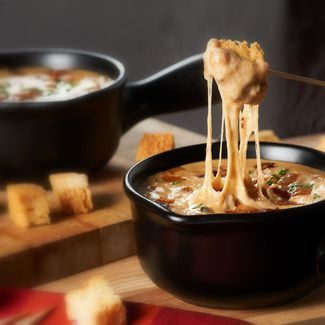 Tip: This fondue can be customized by adding mushrooms, green onions, minced garlic, etc. Don’t like Swiss? Try swapping it out for Gruyere, cheddar or a smoked provolone. Note: To make caramelized onions, heat 1-2 tablespoons of oil in skillet. Add 2 large onions, sliced. Cook over medium-low heat for 15-20 minutes, stirring frequently, until brown and soft.